The University of Oregon Board of Trustees will consider on Friday recommendations to present the university’s highest academic honor, an honorary doctor of philosophy degree, to two distinguished individuals with Oregon roots. 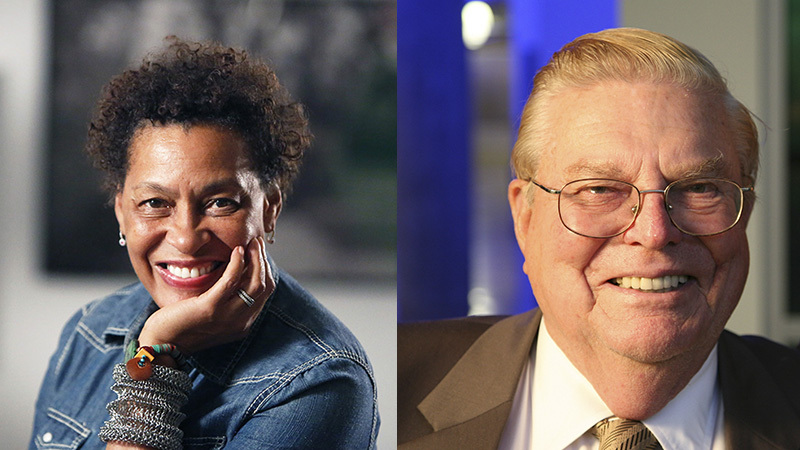 If approved and accepted, renowned artist Carrie Mae Weems of Syracuse, New York, and philanthropist Lorry I. Lokey of Atherton, California, would be the first to receive UO honorary degrees in nearly 10 years. Both are originally from Portland. Schill announced last December that the UO would revive the practice of awarding honorary degrees because they are “a significant way to highlight and show gratitude to those who have made a transformative and lasting impact through scholarship, the arts, or public service.” Past recipients include Mark O. Hatfield, a U.S. senator and Oregon’s 29th governor; Corazon Aquino, the first female president of the Philippines; Marian Wright Edelman, founder of the Children’s Defense Fund; and Helmuth Rilling, founder of the Oregon Bach Festival. At the UO, nominations for honorary degrees come from members of the faculty, staff, alumni and community. Following a review process by a committee made up of faculty members, staff and students and a vote by the University Senate, the UO president can forward up to two names each year to the UO Board of Trustees for final consideration. Long considered one of America’s most influential artists, Weems is the first African-American woman to have a solo exhibition at the Guggenheim Museum. She employs images, video, text and fabric in solo and group artworks that investigate family relationships, cultural identity, sexism, class, political systems, violence and the consequences of power. From her seminal work “The Kitchen Table Series” to last year’s stunning photo collaboration with Mary J. Blige for W magazine, Weems rethinks the way African-Americans, especially women, are portrayed. The world’s major museums and galleries show and collect her work, and her page-long list of honors includes the prestigious Prix de Roma, a medal of arts from the U.S. State Department, a $625,000 MacArthur “genius grant” and the Congressional Black Caucus Foundation’s Lifetime Achievement Award. Weems was born in Portland in 1953. She began her career as an artist at 11 as a participant in dance and street theater. As a teenager, she studied modern dance with Ana Halprin, John Cage and Robert Morris. In her early 20s, she became active politically as a union organizer. She earned her bachelor’s degree from the California Institute of the Arts and a Master’s of Fine Arts from the University of California, San Diego. Upon approval by the board and acceptance by Weems, President Schill hopes she will be able to visit campus during the coming academic year to accept her honorary doctorate and engage with students, faculty and the community. More information is available on the honorary degrees website. Lokey is chair emeritus and founder of Business Wire, the international media relations wire service, which he sold to Berkshire Hathaway in 2006. Since then, the Stanford University graduate has invested more than $800 million to advance learning, beginning with the school he attended as a child, Portland’s Alameda Elementary. An early signer of The Giving Pledge — a commitment by the world’s wealthiest individuals and families to donate most of their wealth — Lokey has given away about 98 percent of his lifetime earnings, mainly to help launch or transform leading teaching and research programs, particularly in fields related to biomedical research. Several major universities in the U.S. and Israel, including the UO, are pursuing discoveries that hold great promise for improving human health and the environment as the result of Lokey’s generosity. At the UO alone, Lokey’s giving exceeds $150 million and enhances the educational experience of every student. He enthusiastically jump-started numerous building projects ranging from new science buildings, among them the Lorry I. Lokey Laboratories and the award-winning Allan Price Science Commons and Research Library to expansion of the School of Music and Dance and renovation of the College of Education’s historic quad. In addition to establishing the UO Fund for Faculty Excellence, he also has made extensive commitments supporting the Phil and Penny Knight Campus for Accelerating Scientific Impact. Upon approval by the board and acceptance by Lokey, he would accept his honorary doctorate during the UO’s 142nd commencement on Monday, June 18. More information is available on the honorary degrees website.